Dyck, Sir Anthony van (1599-1641). Apart from Rubens, the greatest Flemish painter of the 17th century. In 1609 he began his apprenticeship with Hendrick van Balen in his native Antwerp and he was exceptionally precocious. Although he did not become a master in the painters' guild until 1618, there is evidence that he was working independently for some years before this, even though this was forbidden by guild regulations. Probably soon after graduating he entered Rubens's workshop. Strictly speaking he should not be called Rubens's pupil, as he was an accomplished painter when he went to work for him. 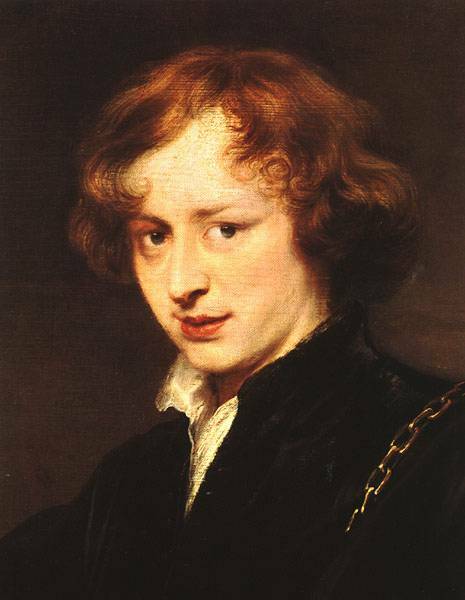 Nevertheless the two years he spent with Rubens were decisive and Rubens's influence upon his painting is unmistakable, although ven Dyck's style was always less energetic. In 1620 van Dyck went to London, where he spent a few months in the service of James I (1566-1625), then in 1621 to Italy, where he travelled a great deal, and toned down the Flemish robustness of his early pictures to create the refined and elegant style which remained characteristic of his work for the rest of his life. His great series of Baroque portraits of the Genoese aristocracy established the `immortal' type of nobleman, with proud mien and slender figure. The years 1628-32 were spent mainly at Antwerp. Van Dyck's influence on English portraiture has been profound and lasting: Gainsborough, in particular, revered him, but he was an inspiration to many others until the early 20th century, when society portraiture ceased to be a major form of artistic expression. He also painted religious and mythological subjects, however, and a surprising facet of his activity is revealed by his landscapes in water-color (British Museum, London). His Iconography (1645) is a series of etchings or engravings of his famous contemporaries. Van Dyck etched some of the plates himself, and many more were engraved after his drawings and oil sketches.